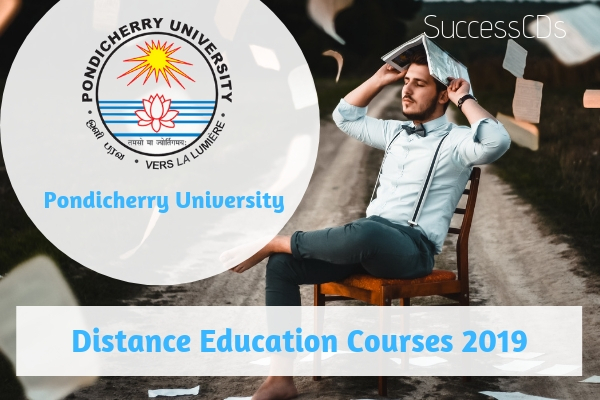 The complete details of Pondicherry University Distance Education Admission 2019-20 for UG Pg and MBA Course such as application form, eligibility criteria, fee details, selection process etc are given below. B.Com. BBA: Bachelor of Commerce 55 Pre-University/Pre-Degree examination of any recognised University/+2/Intermediate/Senior School Certificate examination or any three-year Diploma Course (Polytechnic) conducted by the Central or a State Government. M.Com. in Finance: Student should possess B.Com /BBA /BBM /BISM /BA (Economics)/ MBA/Commerce or Accountancy as a subject in UG Degree/ any degree with CA (Inter) or ICWA (Inter)/CA/ICWA from a recognized institution with in any of the following stream:10+2+3 or 11+1+3 or 11+2+2. MA (English, Sociology & Hindi): Any Degree from the UGC Recognised University under 10+2+3 or 11+1+3 or 11+2+2 system of college education. MBA (Marketing, Finance, IB, HRM & General): Any Degree from the UGC Recognised University under 10+2+3 or 11+1+3 or 11+2+2 system of college education. Students can apply online or from DDE link in Pondicherry University Website www.pondiuni.edu.in. Please read the Information Brochure carefully before filling up the application form. The application form and Information Brochure can be had free of cost from: The DDE office, Pondicherry University, Puducherry-605014, in person or - By post on request with self- addressed Rs.10/- Stamped envelope (25 x 18 cm) addressed to "The Director, DDE, Pondicherry University", Puducherry-605014 or can be downloaded from the University Website www.pondiuni.edu.in.